Christian fiction legend, Frank Peretti. is an absolute master of the thriller/horror genre. With over twenty books under his belt, including children’s and young adult’s, he’s impacted the world with his tales of spiritual warfare. His fifth adult book, the Visitation is no exception. This book was also adapted into film so I’ll review both. First, the novel. The Visitation is a complicated story, basically because it has so many characters it’s nearly impossible to keep up. The story is about a burned out minister named Travis Jordan whose wife died of cancer (Don’t worry, that’s not a spoiler). It then goes on to this mysterious man who enters the town of Antioch. He performs miracles in the same vein as Jesus Christ. Eventually this man builds such a following that nearly the whole town believes he’s the messiah who’s come again in the flesh. All except Travis Jordan, the new minster, Kyle Sherman, and the former minster, Morgan Elliott. Eventually other’s join the action, but that’s not until later. The story is two fold. Not only is it about a false Christ deceiving the town, but it’s also about Travis Jordan’s journey to becoming a minster. Over half of this 520 page book is a flashback going through Travis Jordan’s life from teenager to minister. He and his wife travel to every kind of pentecostal church imaginable, and just about every one is crazy. The story has a lighter feel than his others, but the dark atmosphere is still there. Throughout the book Peretti makes fun of the pentecostal’s crazy ways, such as walking around yelling out in tongues, and their obsession with money. It’s pretty hilarious how they act sometimes. I nearly fell out of my chair laughing at one point! The flashback’s are a story in themselves. It goes from him finding a job, falling in love, then being dumped, then falling in love again, then getting married, then finding the best church to serve in….. It goes on for a very long time, and it will bore impatient readers quickly. I for one, was not bored with it at all! Who gets bored of romance? 🙂 Anyway, as good as the flashback scenes were, he could’ve cut a good load out without deterring from the story. Throughout the story of the false Christ, Peretti goes to warn about the dangers of following signs and wonders, which I mentioned in my last post. These signs lead to a big spiritual deception, and by the third half, things get pretty disturbing and scary. It was interesting to see how the church reacted to a messiah in the flesh, and it wasn’t pretty. Content wise there’s nothing in the first two thirds you need to worry about. The first two thirds are really a drama, and the suspense doesn’t come in until the last third. That’s where it takes on the horror role, and all the violence is packed into that last half. It gets very disturbing at times, for example, there’s a story about a young boy being crucified to a fence, possessed people act crazy and start beating people, and demons are actually visible inside homes, so it gets very scary. At one scene a very young girl is murdered by a demon in a very gruesome manner. That is the worst scene in the book, but it’s only a fleeting moment. Overall though, this is one of Peretti’s masterpieces! It’s written so well and it flows so smoothly that it feels like you’re actually there with the characters! Reading this it’s evident that Peretti is the king of Christian fiction! This film adaption of Peretti’s novel is hard to describe. At one point it sticks pretty close to the book in the essential story, on another it strays pretty far in details. Such as the death of Travis’ wife in the beginning. That’s the major change. The film, to me, has much more of a darker tone than the book, and it’s not afraid to call itself a horror film. It’s a typical Christian film really: Bad quality, mediocre acting, and rushed story line. The characters are not how I pictured them in the book at all! The girl Travis marries in the end is a Christian in the book, but in the film she isn’t. That was a sad change. Story wise it is an abridged version of the book, and leaves more out than it changes. The flashbacks are not even evident in this film, and I was very disappointed in that since the flashbacks contain some of the very best scenes from the book. Content wise the film is rated M (Australian rating) and doesn’t really have anything objectionable in it. Violence is pretty minimum, there’s nothing sexual, there’s no language, which is a great change for this type of film. The objectionable stuff is in the tone of the film. It’s pretty scary, so it’s not suitable for twelve years and under. Young teenagers won’t have a problem. The possession scenes are poorly done as well, and are more comical than scary. Overall this film was a disappointment, though not a complete failure. In the end the Bible is what saves, so it’s Christian message is pretty strong. I must take note that this book and film are not for the unbeliever. They will think Christian’s are a bunch of crazies if they read or watch it. It’s obviously written for Christian’s alone and is not for evangelical use. 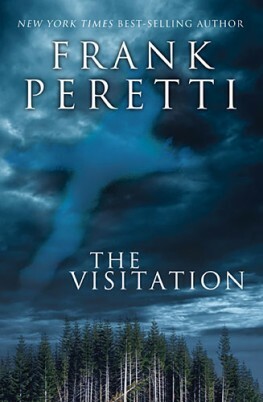 Anyway I highly recommend the Visitation by Frank Peretti in it’s novel form. Skip the film. It may not be the happiest story ever written, but it certainly opens eyes! Previous postSigns from man, or God?